Spinit is one of the latest online casinos where UK players are welcome to join the fun. At Spinit you will find all the best online casino games in a fun and user friendly environment. 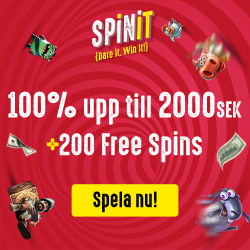 If you want to see and try if you like Spinit you can always sign up and at the same time you will get a great welcome bonus that will get you started. But that isn’t all there is to enjoy at Spinit. You can also grab a new reload bonus every Monday in order to get a kick start every week and on Wednesdays you can get free spins on a selected videoslot at Spinit. If you’re interested in playing at Spinit you can get a spinning start with up to £1000 together with 200 bonus spins if you accept the casino’s welcome bonus. It’s all divided into your first four deposits. When you make you first deposit you will get a 100% bonus up to £200 together with 200 free spins. These spins will be credited to your account for ten consecutive days and they will be available on the popular videoslot called Starburst. After that you will receive 50% bonus up to £200 when you make your second deposit. Last but not least you can grab 25% extra up to £300 on both your third and fourth deposit to your account at Spinit. Don’t forget to sign up at Spinit’s newsletter that will be sent to your e-mail with information about the latest promotions as well as exclusive bonuses. As a member at Spinit you will get the chance to grab a reload bonus every Monday. Just click your way to the cashier and choose the 25% reload bonus before you make your deposit. You will get a bonus up to £100 – this means that you can deposit £400 and get another £100 as a bonus which means that you will have a whole £500 to play with! Keep in mind that wagering requirements are connected to the bonuses and free spins winnings at Spinit. Another great promotion that you can look forward to every week at Spinit is “Spinner’s Choice” on Wednesdays. Every week there is a new hand-picked game with the possibility to get both free spins and another reload bonus. You will find all the details in your inbox!